What's A Good Car Loan Interest Rate? /Credit and Financing /Car Loan Interest Rates: What’s Good? Your Credit History. If you have a history of late payments, unpaid debts, collections, civil judgments, defaulted loans, or bankruptcy, you’ll most likely end up paying a higher interest rate. If you’re not sure about your credit history, get a copy of your credit report, read through it carefully, and then take care of any problems that you may have. Take a look at our tips on how to fix your credit for more information if any of this applies to you. Your “Available Credit” Ratio. Even if you have a better-than-average credit history, you can still end up paying a higher interest rate that you should if your available credit ratio is out of whack. What’s an available credit ratio? Lenders add up all your available sources of credit – your home equity loan, credit cards, etc. – and they compare it to how much debt you have. If you’re using more than half of your available credit, lenders will often give you a higher interest rate because you fit the profile of a person that’s living on credit. If you want to improve your available credit ratio, either pay off your debt (hard) or get more credit (easy). The Type Of Car You Want To Buy. The older a car is, the more interest you’re going to pay. A one- or two-year-old car will usually qualify for the same rate as a brand new car, but once vehicles start to get older then that you start to see the interest rate go up. Once a vehicle reaches ten years of age, the interest rates explode. Also keep in mind that the higher the mileage on a car, the higher the interest rate will be. Most lenders charge a steep interest rate for cars with more than 80,000 miles, and many don’t even offer financing for cars with more than 100,000 miles. The reason? 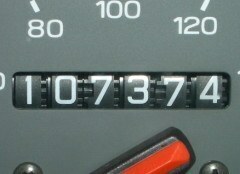 Once cars get that high in mileage, they’re more likely to suffer a major break-down. Many people, when they realize they can’t afford to fix a major repair, simply stop making payments. The bank wants to avoid this scenario so they charge a high interest rate to discourage you from buying a high-miles car. So what does this all mean? When you’re trying to figure out what a good interest rate is, you need to consider your credit history, take a look at your available credit ratio, and consider the type of car you want to buy. The smartest thing that you can do is to get financing quotes online. We like online quotes because they’re easy and fast, and they help you find out what is the best interest rate for your situation.